Now Live! 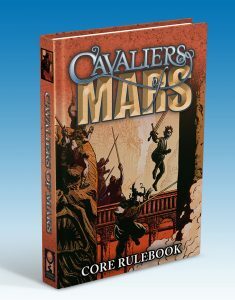 Cavaliers of Mars Kickstarter! Our Kickstarter for Rose Bailey’s Cavaliers of Mars is now live! Cavaliers of Mars is powered by the original DEIMOS system, in which a hero’s motivations and approach to problems strongly influence her chance of success. In combat, heroes face off with their enemies in contests of tactics and chance. October 2019!!!?? Are you kidding? Regardless…I am highly excited about this and absolutely cannot wait. This is the first time I have backed something due to money not always being tight, but this is well worth it. I have run the Jumpstart 7 times now and can now enjoy the actual full world of it.